This pest is about an inch long and half inch wide with wings folded. Nymphs (immature insect) are 1/4 to 1/2 inch long and develop in four stages, all of which are wingless. Egg masses have a gray covering which may be dry as it ages. Older egg masses may lose their covering and appear as columns of 30 – 50 seed-like eggs, these eggs may be found on trees, rocks or other hard surfaces. For more information about the SLF visit PennState Extension. 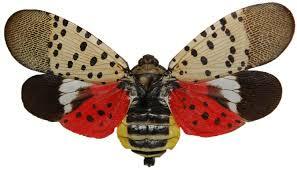 Tree of Life Services can treat for Spotted Lanternflies. Call today!